Home→Southeastern→What are passengers satisfied with? ← Which is the first off-peak train to London? 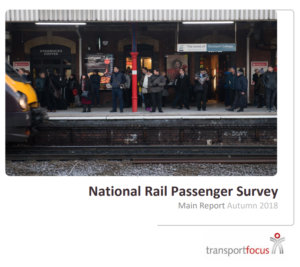 Transport Focus have released their Autumn 2018 passenger satisfaction survey. Overall 78% of Southeastern customers were satisfied with their last journey. Southeastern are featuring the finding that the overall satisfaction has risen 3 percentage points since Spring 2018. But that looks like a bit of positive spin. The Spring 2018 score was 2 percentage points down on the Autumn 2017. And Transport Focus say that neither the previous decrease nor the new increase are significant. (The sample size was 1463, so the margin of error is around +/-3%.) In reality overall customer satisfaction is little changed over a year and still too low. Transport Focus also measure customer satisfaction on 40 specific aspects of the journey. Strangely on 36 out of these 40 aspects satisfaction was less than 78% – including toilets at stations (51% – 10 points down in the last year), toilets on trains (41% – but at least 11 points up over the last year, as Southeastern have resumed emptying them), and how Southeastern deal with delays (40%). On the positive side, satisfaction is higher than 78% on provision of information at stations, how requests to station staff was handled, the length of time the journey was scheduled to take (actually a Network Rail measure), and the overall satisfaction with the station. Even on the overall score, Southeastern are still well short of what Transport for London achieve on London Overground – 85% overall customer satisfaction. If the Secretary of State had not blocked the transfer of Southeastern Metro to TfL, we in the Sevenoaks area could be enjoying that – and Southeastern would have some direct competitive pressure to improve customer satisfaction mainline services. In short, customer satisfaction has not significantly improved over the last year, despite the end of the London Bridge works, many aspects of the journey are still falling well short of what customers expect, and other transport operators are achieving better results with the same Victorian infrastructure. Southeastern should not be getting out the champagne yet! Good results for the highly expensive HS1 service mask the miserable results for the Classic services that the majority of Southeastern’s passengers use, only 78% for Metro and just 74% for Mainline. The figures for the comparable London Overground / TfL Rail lines are far better, 91% for Euston – Watford and 87% for Liverpool Street – Shenfield. Thanks to Chris Grayling blocking our long awaited rail devolution, we still don’t have a worthwhile smart card: unlike Oyster, The Key doesn’t offer PAYG and you can’t even avoid the station queues by buying day tickets online and downloading them as you touch in at the gate. Literally nobody I know has been surveyed for this. Makes you wonder if they survey “the right type” of passenger? In statistical terms a random sample of 1,463 is usually large enough to get a result that is accurate in 95% of instances to within plus or minus 3%. That’s the basis of opinion polls, for instance. That having been said, it’s not clear whether the Transport Focus sample is skewed by different rates of response – for instance the difficulty of surveying peak hour trains or the greater likelihood of leisure travellers having the time to fill in the form. Political opinion polls adjust for demographics and for likelihood of voting, but it’s not easy and even they do not always get it right. We also consider that the Transport Focus methodology, by asking about only the current journey, underweights the commuter experience of day-in, day-out minor misery. That may be why the Which? survey, which asks about experience over a period of time, always shows a much lower level of customer satisfaction.